The following steps are needed in order to activate your student/access card. Please be very careful to follow all the steps. Go to http://order.dtuclimbing.dk/ and complete the order process. Locate your card number. 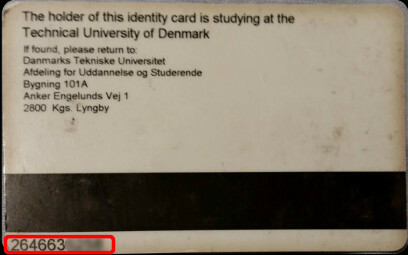 The card number is found on the back of the study card, and is 8 to 10 digits. If you do not have an access card, you should come by in the club during the facility tryout times (as described on the front page). Here a board member will be able to hand you an access card. Afterwards, continue with step 3. Choose and pay for your order below. 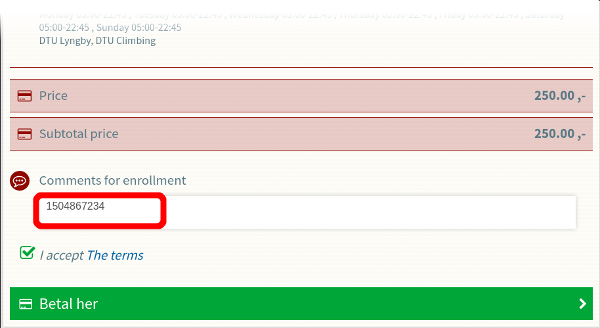 During the order process, you MUST ENTER THE CARD NUMBER AS THE COMMENT FOR ENROLLMENT. This is very important to remember, as you will not get access to the club without entering the number. Wait a couple of days for your card to get activated. You should receive an email when it is activated. Choose this if you ordered using "No attachment to DTU". Payment is 350DKK + transaction fees.